Lund University (Swedish: Lunds universitet) is a public university, consistently ranked among the world's top 100 universities. The university, located in the city of Lund in the province of Scania, Sweden, arguably traces its roots back to 1425, when a Franciscan studium generale was founded in Lund next to the Lund Cathedral. After Sweden won Scania from Denmark in the 1658 Treaty of Roskilde, the university was founded in 1666 on the location of the old studium generale next to Lund Cathedral. Lund University has eight faculties, with additional campuses in the cities of Malmö and Helsingborg, with 40,000 students in 270 different programmes and 1 300 freestanding courses. The University has some 600 partner universities in nearly 70 countries and it belongs to the League of European Research Universities as well as the global Universitas 21 network. Two major facilities for materials research are in Lund University: MAX IV, which is a world-leading[peacock term] synchrotron radiation laboratory – inaugurated in June 2016, and European Spallation Source (ESS), a new European facility that will provide up to 100 times brighter neutron beams than existing facilities today, to be opened in 2023. The university centers on the Lundagård park adjacent to the Lund Cathedral, with various departments spread in different locations in town, but mostly concentrated in a belt stretching north from the park connecting to the university hospital area and continuing out to the northeastern periphery of the town, where one finds the large campus of the Faculty of Engineering. Lund University main building, built in 1882, drawn by Helgo Zettervall. The city of Lund has a long history as a center for learning and was the ecclesiastical centre and seat of the archbishop of Denmark. A cathedral school (the Katedralskolan) for the training of clergy was established in 1085 and is today Scandinavia's oldest school. The university traces its roots back to 1425, when a Franciscan studium generale (a medieval university) was founded in Lund next to the Lund Cathedral (with baccalaureus degree started in 1438), making it the oldest institution of higher education in Scandinavia followed by studia generalia in Uppsala in 1477 and Copenhagen in 1479. After Sweden won Scania from Denmark in the 1658 Treaty of Roskilde, the university was founded in 1666 on the location of the old studium generale next to Lund Cathedral. The studium generale had not survived the Lutheran Reformation of 1536, which is why the university is considered a separate institution when founded in 1666. After the Treaty of Roskilde in 1658, the Scanian lands came under the possession of the Swedish Crown, which founded the University in 1666 as a means of making Scania Swedish by educating teachers in Swedish, and to culturally integrate the Scania region with Sweden. The university was named Academia Carolina after Charles X Gustav of Sweden until the late 19th century, when Lund University became the widespread denomination. It was the fifth university under the Swedish king, after Uppsala University (1477), the University of Tartu (1632, now in Estonia), the Academy of Åbo (1640, now in Finland), and the University of Greifswald (founded 1456; Swedish 1648–1815, now in Germany). The university was at its founding granted four faculties: law, theological, medicine and philosophy. They were the cornerstones, and for more than 200 years this system was in effect. Towards the end of the 17th century, the number of students hovered around 100. Some notable professors in the early days were Samuel Pufendorf, a juridical historian; and Canutus Hahn and Kristian Papke in philosophy. The Scanian War in 1676 led to a shut-down, which lasted until 1682. The university was re-opened largely due to regional patriots, but the university was not to enjoy a high status until well into the 19th century. Lecturing rooms were few, and lectures were held in the Lund Cathedral and its adjacent chapel. The professors were underpaid. View of the Historical Museum building in the 19th century. In 1716, Charles XII of Sweden entered Lund. He stayed in Lund for two years, in between his warlike expeditions. Lund and the university attracted a temporary attention boost. The most notable lecturer during this time was Andreas Rydelius. Peace was finally restored with the death of Charles XII in 1718, and during the first half of the 18th century the university was granted added funds. The number of students was now well around 500. Despite not being on par with Uppsala University, it had still built a solid reputation and managed to attract prominent professors. Around 1760 the university reputation dropped as the number of students fell below 200, most of whom hailed from around the province. However, by 1780 its reputation was largely restored, and continued to rise through the 1820s. This was largely owing to popular and well-educated lecturers particularly in philology; the prominent professor Esaias Tegnér was a particularly notable character with widespread authority. He, in turn, attracted others towards Lund. One of these was the young theological student C. G. Brunius, who studied ancient languages under Tegnér and were later to become professor of Greek. With time he was to devote himself to architectures and he redesigned several of Lund's buildings, as well as churches of the province. In 1845 and 1862 Lund co-hosted Nordic student meetings together with the University of Copenhagen. A student called Elsa Collin was the first woman in the whole of Sweden to take part in a spex. The University Square in the 1910s. In the early 20th century, the university had a student population as small as one thousand, consisting largely of upper-class pupils training to become civil servants, lawyers and doctors. In the coming decades it started to grow significantly, until it became one of the country's largest. In 1964 the social sciences were split from the Faculty of Humanities. Lund Institute of Technology was established in 1961 but was merged with Lund University eight years later. In recent years, Lund University has been very popular among applicants to Swedish higher education institutions, both nationally and internationally. For studies starting in autumn 2012, Lund received 11,160 foreign master's applications from 152 countries, which was roughly one third of all international applications to Swedish universities. The first woman to study in Lund was Hildegard Björck (spring of 1880) who had previously studied in Uppsala and had there been the first Swedish woman ever to get an academic degree. Her tenure in Lund was however very brief and the medical student Hedda Andersson who entered the university later in 1880 (two years before the next woman to do so) is usually mentioned as the first woman at Lund University. Hilma Borelius was the first woman who finished a doctorate in Lund, in 1910. The first woman to be appointed to a professor's chair was the historian Birgitta Odén (1965). In 1992 Boel Flodgren, Professor of Business Law, was appointed rector magnificus (or, strictly speaking, rectrix magnifica) of Lund University. As such, she was the first woman to be the head of a European university. Kungshuset, the oldest university building (completed 1584). The university's facilities are mainly located in the small city of Lund in Scania, about 15 km away from central Malmö and 50 km from Copenhagen. The large student- and staff population makes an impact on the city, effectively making it a university town. Over a hundred university buildings scatter around town, most of them in an area covering more than 1 km², stretching towards the north-east from Lundagård park in the very centre of town. Buildings in and around Lundagård include the main building, Kungshuset, the Historical Museum and the Academic Society's headquarters. The main library building is located in a park 400 meters to the north, followed by the large hospital complex. Lund University has a satellite campus in nearby Malmö, Sweden's third largest city. The Faculty of Fine and Performing Arts' three academies: Malmö Art Academy, Malmö Academy of Music and Malmö Theatre Academy, are all located in Malmö. The city is also the location of Skåne University Hospital, where Lund University performs a considerable amount of research and medical training. Campus Helsingborg is, as the name suggests, located in the city of Helsingborg, almost 50 km from Lund. Opened in 2000, it consists of a building in the city centre, right next to the central train station and the harbour. Nearly 3,000 students are based on the campus. The Department of Service Management and the Department of Communication and Media are among those located at the campus in Helsingborg. Teaching and training at the School of Aviation (LUSA) takes place at an airfield next to the town of Ljungbyhed, about 40 km away from Lund. Lund University library was established in 1668 at the same time as the university and is one of Sweden's oldest and largest libraries. Since 1698 it has received legal deposit copies of everything printed in the country. Today six Swedish libraries receive legal deposit copies, but only Lund and the Royal Library in Stockholm are required to keep everything for posterity. Swedish imprints make up half of the collections, which amount to 170,000 linear metres of shelving (2006). The library serves 620,000 loans per year, the staff is 200 full-time equivalents, and the 33 branch libraries house 2600 reading room desks. The current main building at Helgonabacken opened in 1907. Before that, the old building was Liberiet close to the city's cathedral. Liberiet was built as a library in the 15th century, but now serves as a cafe. Education and research in the health sciences at the university is operated in cooperation with Skåne University Hospital, located in both Lund and Malmö. Medical education takes place in the Biomedical Centre, next to the hospital in Lund. Nursing and occupational therapy are taught in the Health Sciences Centre nearby. The university also operates the Clinical Research Centre in Malmö, featuring many specialized laboratories. There are over 100 faculty. The University Board is the University's highest decision-making body. The Board comprises the Vice-Chancellor, representatives of the teaching staff and students, and representatives of the community and business sector. Chair of the board is Margot Wallström. Executive power lies with the Vice-Chancellor and the University Management Group, to which most other administrative bodies are subordinate. Esaias Tegnér statue near the towering Lund Cathedral. Approximately 42,000 students study within one of the 276 educational programs, the 100 international master's programmes or the 2,200 independent courses. Around five hundred courses are, or can be, held in English for the benefit of international exchange students. There are several programmes allowing foreign students to study abroad at the University. Notable exchangees include United States Supreme Court Justice Ruth Bader Ginsburg, who spent time at Lund University in the 1960s conducting research. The university offers 9 out of the 20 most sought after programmes in Sweden. The master's programme in International Marketing is the most popular choice in the country, with almost a thousand applications yearly. Students are awarded ECTS credits for all completed courses. Grading scales vary by programme and even course; "Pass/Fail" and "Pass with distinction/Pass/Fail" are most common, but ECTS grades are increasingly given as well. Engineering students generally receive grades as "5/4/3/Fail". Lund University is well known as one of Scandinavia's largest research universities. It ranks among top performers in the European Union in terms of papers accepted for publication in scientific journals. It is one of Sweden's top receiver of research grants, most of which come from government-funded bodies. The EU is the university's second largest external research funder and Lund is the 23rd largest receiver of funding within the union's Seventh Framework Programme. The university is active in many internationally important research areas such as nanotechnology, climate change and stem cell biology. One of the most famous innovations based on research from Lund University is diagnostic ultrasound, which is today a routine method of examination in hospitals around the world. Other examples of pioneering innovations are the artificial kidney, which laid the foundations for the multinational company Gambro and which makes life easier for dialysis patients worldwide, and Bluetooth technology, which enables wireless communication over short distances. Here is a sample selection of discoveries from Lund through the ages. Lund University is among the most renowned institutions of higher learning in the Nordic countries and is commonly ranked within the top 100 in the world by the most influential ranking agencies. Lund was ranked 60th in the world in the 2014/15 QS World University Rankings. In 2015, it ranked 90th in the world by the Times Higher Education World University Rankings, and in the Academic Ranking of World Universities, compiled by Shanghai Jiao Tong University, it was in the 101-150 category. In the Leiden Ranking for 2017, Lund University is ranked 84th in the world. In 2014, the National Secretary of Higher Education, Science, Technology and Innovation, Ecuador (Senescyt), as a parameter for awarding scholarships, created a list of top Universities around the world placing Lund University in Top 1 in "Natural Sciences, Mathematics and Statistics" and Top 3 in both fields: "Information Technology and Communication" and "Engineering, Manufacturing and Construction". The 2013–2014 Times Higher Education World University Rankings' Engineering and Technology table placing Lund University 78 around the world., in "Art and Humanities" 74th, in "Clinical, Pre-clinical and Health" 77th, in "Life Sciences" 67th, and in "Physical Sciences" 57th. The 2015–2016 URAP (University Ranking by Academic Performance) placed to Lund University 87th in the world with qualification A++. The 2015–16 Times Higher Education World University Rankings placed the university in 90th place worldwide. AF-borgen, the student-run complex at the heart of student life in Lund, May 2002. Lund student life is based on three central structures: the student nations, the Academic Society (AF) and the student unions. Before July 1, 2010, students were required to enroll in a student union, nation and AF in order to receive grades at the university, but this is no longer compulsory. Students may still enroll in these organizations if they wish. The nations in Lund are a central part of the university's history, initially serving as residential colleges for students, organized by geographic origin. Östgöta Nation, the oldest nation, was established in 1668, two years after the university was founded. While the nations still offer limited housing, today they are best described as student societies. Today students may enroll in any nation, although the nations still preserve their geographic names. In most cases it does not matter what nation one enrolls in, but different nations offer different activities for interested students. Each nation has student housing, but the accommodations in no way meet demand, and they are usually appointed according to a queue system. Each nation has at least one pub evening per week, with a following night club. The solemn peak event in the course of an activity year is the organization of student balls once a year. Most well known of the nation balls (as opposed to balls organized by student unions) is the ball hosted by Göteborgs Nation - called the "Gustaf II Adolf Ball" (also known as the "GA-Ball"). Most nations also host at least one banquet per week, where a three course dinner is served. Each nation also has different activities for students interested in sports, arts, or partying. All activities within the nations are voluntary. In 1830, Professor Carl Adolph Agardh formed Akademiska Föreningen (The Academic Society), commonly referred to as AF, with the goal of "developing and cultivating the academic life" by bringing students and faculty from all departments and student nations together in one organization. Prince Oscar, then Sweden's Chancellor of Education, donated 2000 Kronor to help found the society. In 1848, construction began on AF-borgen (the AF Fortress), which is located opposite the Main Building in Lundagård. To this day, AF is the center of student life in Lund, featuring many theater companies, a prize-winning student radio (Radio AF), and organizing the enormous Lundakarnevalen (the Lund Carnival) every four years. "AF Bostäder", an independent foundation with close ties to Akademiska Föreningen, maintains over 5,700 student residences in Lund. The Delphi residential area, located in the northern part of Lund, is one of the large student housing complexes run by AF Bostäder. The student unions represent students in various decision-making boards within the university and council students regarding their rights, housing and career options. There are nine student unions, one for each faculty and an additional union for doctoral students. Lund's Doctoral Student Union is further divided into councils, one for each faculty except for the faculties of engineering and fine and performing arts. The unions are incorporated into the Association of Lund University Student Unions (LUS). It has two full-time representatives who go to weekly meetings with the vice-chancellor and other organizational university bodies. The student union association runs services such as loan institute, a day-care centre and a website with housing information. It also publishes the monthly Lundagård magazine. Tage Erlander & Bertil Ohlin 1954. Ruth Bader Ginsburg, SCOTUS photo portrait. Karl Manne Siegbahn, Nobel Prize in Physics. Swedish author Viktor Rydberg with signature. Alumni and faculty of Lund University are associated with, among other things: the creation of the first implantable pacemaker, the development of echocardiography, the spread of modern physiotherapy, the discovery of the role of dopamine as an independent neurotransmitter, the determination of the number of chromosomes of man, the establishment of osseointegration, the development of the Bluetooth technology, and the creation of the Rydberg formula. The following is a selected list of some notable people who have been affiliated with Lund University as students or academics. Samuel Pufendorf (1632–1694) was a notable jurist and philosopher known for his natural law theories, influencing Adam Smith  as well as Thomas Jefferson. Olof von Dalin (1708–1763) was an influential Swedish writer and historian of the late enlightenment era. Peter Wieselgren (1800–1877) was a Swedish priest, literature critic and prominent leader of the Swedish temperance movement. Knut Wicksell (1851–1926) was an influential economist, sometimes considered one of the founders of modern macroeconomics. Oscar Olsson (1877–1950) was an important developer of self-education in Sweden and known as the father of study circles. Bertil Ohlin (1899–1979) received the Nobel Prize in economic sciences in 1977 for theories concerning international trade and capital, and was the leader of the Liberal's Peoples Party (Folkpartiet) for 23 years. Gunnar Jarring (1907–2002) was Sweden's ambassador in UN 1956–1958, and Sweden's ambassador in Washington DC 1958–1964. Britta Holmström (1911–1992) was the founder of Individuell Människohjälp (IM), a human rights organization with activities in 12 countries. Torsten Hägerstrand (1916–2004) was an internationally renowned geographer, considered the father of 'time geography' and receiver of the Lauréat Prix International de Géographie Vautrin Lud in 1992. Judith Wallerstein (1921–2012) was a renowned psychologist and internationally recognized authority on the effects of marriage and divorce on children and their parents. Carl Linnaeus (1707–1778), began his academic career in Lund by studying medicine and botany for a year before moving to Uppsala. He is known as the father of modern taxonomy, and is also considered one of the fathers of modern ecology. Pehr Henrik Ling (1776–1839) is considered the prime developer of natural gymnastics, the father of Swedish massage, and one of the most important contributors to the development and spread of modern physical therapy. Carl Adolph Agardh (1787–1859) made important contributions to the study of algae and played an important role as a politician in raising educational standards in Sweden. Elias Magnus Fries (1794–1878) was a notable botanist who played a prominent role in the creation of the modern taxonomy of mushrooms. Nils Alwall (1904–1986) was a pioneer in hemodialysis who constructed the first practical dialysis machine, commercialized by The Gambro Company. Rune Elmqvist (1906–1996) was a physician and medical engineer who developed the first implantable pacemaker as well as the first inkjet ECG printer. Lars Leksell (1907–1986) was a notable neurosurgeon who was the father of radiosurgery and later the inventor of the Gamma Knife. Inge Edler (1911–2001) developed the medical ultrasonography in 1953, commonly known as echocardiography, together with Hellmuth Hertz, and was awarded the Lasker Clinical Medical Research Award in 1977. Sune Bergström (1916–2004) and Bengt Samuelsson (1934–) were awarded the Nobel Prize in Physiology or Medicine in 1982 for "discoveries concerning prostaglandins and related biologically active substances". Arvid Carlsson (1923–) was awarded the Nobel Prize in Physiology or Medicine in 2000 for "discoveries concerning signal transduction in the nervous system" and is noted for having discovered the role of dopamine as an independent neurotransmitter. (1931–2012) is sometimes considered the foremost contributor to the modern theory of linear partial differential equations and received the Fields Medal in 1962 for his early work on equations with constant coefficients. Karl Johan Åström (1934–) is a notable control theorist, who in 1993 was awarded the IEEE Medal of Honor for "fundamental contributions to theory and applications of adaptive control technology". Sven Mattisson (1955–) is an electrical engineer who was one of the developers of the Bluetooth technology. Rutger Macklean (1742–1816) was a prominent captain, politician and land owner remembered for introducing agricultural reforms leading to more effective large-scale farming in Sweden. Ernst Wigforss (1881–1977) was Sweden's finance minister 1925–1926 and 1932–1949 and has been considered the 'foremost developer of the Swedish Social Democracy'. Östen Undén (1886–1974) was an internationally recognized professor of law and Sweden's minister of foreign affairs 1924–1926 and 1945–1962. Tage Erlander (1901–1985) was Sweden's prime minister 1945–1969, potentially a record of uninterrupted tenure in parliamentary democracies, and led his party through eleven elections. 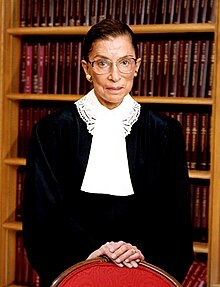 Ruth Bader Ginsburg (1933–) is a justice of the supreme court of the USA, the second female justice to be in this position. Ingvar Carlsson (1934–) served as Sweden's prime minister 1986–1991 and 1994–1996 and as Sweden's deputy prime minister 1982–1986. Rupiah Banda (1937–) was the president of Zambia 2008–2011 and its vice president 2006–2008. Leif Silbersky (1938–) is a notable lawyer and author famous for representing so called high-profile cases in Sweden. Marianne Lundius (1949–) is since 2010 the president of the Supreme court of Sweden, the first female justice in this position. Utoni Nujoma (1952–) was Namibia's minister of foreign affairs 2010–2012 and is since 2012 the country's minister of justice. Thomas Thorild (1759–1808) was a notable Swedish writer, poet, and philosopher who, among many things, was an early proponent of gender equality. Esaias Tegnér (1782–1846) was an influential writer, poet, bishop and professor of the Greek language, perhaps most famous for his work Frithiofs Saga. Viktor Rydberg (1828–1895) was a notable journalist, writer and researcher, most famous for his works Tomten and Singoalla and regarded as one of Sweden's most important authors of the 19th century. Frans G Bengtsson (1894–1954) was a Swedish writer and poet famous for his novels The Long Ships (Röde Orm) which have been translated to at least 23 languages. Fritiof Nilsson Piraten (1895–1972) was a Swedish lawyer and popular author, known for his works Bombi Bitt och Jag and Bock i Örtagård. Hjalmar Gullberg (1898–1961) was a notable writer and poet who was also the head of the Swedish Radio Theatre 1936–1950. Ivar Harrie (1899–1973) was one of the founders of the newspaper Expressen, as well as its editor in chief 1944–1960. Hans Alfredsson (1931–2017) was a Swedish comedian, author and actor, sometimes regarded as the foremost representative of the so-called Lundahumorn (the humour from Lund). Axwell (Born as Axel Christofer Hedfors, 1977–) is a world-renowned DJ, perhaps best known as a member of the trio the Swedish House Maffia. Hans Rausing (1926–) was the managing director of Tetra Pak 1954–1985 and the company's chairman 1985–1993, and has been ranked as the third richest man in Sweden. Pehr G. Gyllenhammar (1935–) is a businessman who was the CEO and chairman of Volvo 1971–1983 and 1983–1993 respectively, the chairman of Procordia 1990–1992, Aviva 1998–2005, Investment AB Kinnevik 2004–2007, and is the current vice chairman of Rothschild Europe. Bertil Hult (1941–) founded EF Education from his dormitory in Lund  and was the company's CEO until 2002 and chairman until 2008. Olof Stenhammar (1941–) is a Swedish financier and businessman who founded Optionsmäklarna, OM, that later changed its name to OMX and today is a part of the NASDAQ OMX Group. Michael Treschow (1943–) is the current chairman of Unilever and was the CEO of Atlas Copco and Elektrolux 1991–1998 and 1998–2002 respectively, as well as the chairman of Ericsson 2002–2011. Stefan Persson (1947–) was the CEO of H&M 1982–1997 and has been the company's chairman since 1998 and has been ranked among the top ten richest men in the world. Dan Olofsson (1950–) is a Swedish entrepreneur and philanthropist who founded the company Sigma and the foundation Star for Life and is a large shareholder in the company ÅF. Anders Dahlvig (1957–) was the CEO and President of the IKEA group between 1999 and 2009, during which IKEA experienced an average growth of 11 percent, and is the current chairman of the New Wave Group. Charlotta Falvin (1966–) is a Swedish businesswoman who is the chairman of the companies Teknopol, Barista, Multi-Q and Ideon AB and the previous CEO of TAT and Decuma. Ann-Sofie Johansson is the Creative Advisor and former Head of Design for fashion retailer H&M. Cristina Stenbeck (1977–) is a Swedish businesswoman who is the current chairman of Investment AB Kinnevik. Lund University cooperates with universities on all continents, both in areas of research and student exchange. Apart from being a member of the prestigious LERU and Universitas 21 networks, the university participates in the European Erasmus and Nordplus programmes. It also coordinates several intercontinental projects, mostly through the Erasmus Mundus programme. ^Note a Prepared for both the book and the sword – to study and to defend the country in times of war. The lion in Lund University's seal holds a book in one hand, and a sword in the other. ^ "LUND UNIVERSITY AT LUND AND HELSINGBORG, SWEDEN". EduMaritime.net. Retrieved 31 May 2015. ^ a b c Facts and figures Lund University web site. ^ . Lund University official web site. Retrieved 21 May 2017. ^ "University world rankings - LUND UNIVERSITY – A TOP 100 UNIVERSITY". Retrieved 21 May 2017. ^ "QS World University Rankings - 2015". Top Universities. Retrieved 31 May 2015. ^ "Management and leadership". Retrieved 5 July 2016. ^ "About Lund University - Lund University". Lund University. 2016-07-05. Retrieved 2016-07-05. ^ ESS Mandate Retrieved 21 May 2017. ^ a b "Home - Lund University". Archived from the original on 5 November 2012. Retrieved 31 May 2015. ^ "Decrease in international applicants to Swedish universities". Archived from the original on 24 January 2016. Retrieved 31 May 2015. ^ a b "Home - Lund University". Archived from the original on 4 September 2013. Retrieved 31 May 2015. ^ "Home - Lund University". Archived from the original on 24 August 2014. Retrieved 31 May 2015. ^ Linda, Bayer "Ruth Bader Ginsburg" (Philadelphia: Chelsea House Publishers, 2000), 46. ^ a b "Research excellence areas". Retrieved 31 May 2015. ^ Over 300 years of useful Research - Lund University. Retrieved 30 April 2013. ^ "QS World University Rankings". Topuniversities. Retrieved 2012-04-20. ^ "Lund University". Retrieved 31 May 2015. ^ "Leiden CWTS Ranking 2017". Leiden University. Retrieved 2017-06-20. ^ "LISTADO-DE-UNIVERSIDADES-CIENCIAS-NATURALES-MATEMÁTICAS-Y-ESTADISTICAS.docx". Retrieved 31 May 2015. ^ "LISTADO-DE-UNIVERSIDADES-TECNOLOGIA-DE-LA-INFORMACION-Y-COMUNICACION.docx". Retrieved 31 May 2015. ^ "LISTADO-DE-UNIVERSIDADES-INGIENERIA-INDUSTRIA-Y-CONSTRUCCION.docx". Retrieved 31 May 2015. ^ "Top 100 universities for engineering and technology 2013-2014". Retrieved 31 May 2015. ^ "Top 100 universities for arts and humanities 2013-2014". Retrieved 31 May 2015. ^ "Top 100 universities for clinical, pre-clinical and health 2013-2014". Retrieved 31 May 2015. ^ "Top 100 universities for life sciences 2013-2014". Retrieved 31 May 2015. ^ "Top 100 universities for physical sciences 2013-2014". Retrieved 31 May 2015. ^ "World University Rankings 2014-15". The Times Higher Education. Retrieved 10 September 2015. ^ "Frihet och inflytande - kårobligatoriets avskaffande". Regeringen.se. Archived from the original on 2011-06-12. Retrieved 2012-04-20. ^ "European Society for the History of Economic Thought". ^ "Ludwig Von Mises Institute". Archived from the original on 2014-05-06. ^ "Socratic Seminar in the Tradition of Early Swedish Popular Education" (PDF). ^ "IM Annual report 2012" (PDF). Archived from the original (PDF) on 2018-08-20. Retrieved 2018-12-17. ^ "Lund University Magazine". Archived from the original on 2005-11-20. ^ "Axelsons Gymnastiska Institut". Archived from the original on 2013-11-20. ^ "Chiropractors Warwick". Archived from the original on 2013-05-31. ^ "The new international encyclopaedia". ^ "Circulation, Journal of the American Heart Association" (PDF). ^ "The Discovery of Dopamine, Wallenberg Neuroscience Center". ^ "Australian Biochemist" (PDF). Archived from the original (PDF) on 2013-04-28. ^ "Lars Hormander Winner of Wolf Prize in Mathematics - 1988". 1988. Retrieved 28 January 2015. ^ Tilton, Timothy A. (1979). "A Swedish Road to Socialism". The American Political Science Review. 73 (2): 505–520. doi:10.2307/1954894. JSTOR 1954894. ^ "Director". Archived from the original on 2013-04-26. ^ "How I got my job... as an H&M fashion boss". www.glamourmagazine.co.uk. Retrieved 2017-10-06. Lunds universitet from Nordisk familjebok, in Swedish. ^ Staahl, Magnus Laurentius (1834). "Biographiske underrättelser om professorer vid Kongl. Universitetet i Lund, ifrån dess inrättning till närvarande tid".